I'm killing some time before hitting the road...I don't want to be too early to my next stop. I printed out Walt Crawford's latest Cites & Insights just before leaving. I guess this in one of those times where I love that Walt designs this as a ".pdf" file with all the well planned graphic design for the physical printed page. It seems to me that every writer is different. Each successful writer has struggled with and found the way to write which works for her or himself. Walt is no exception. The one common thread I would note, is that all successful writers structure their day and their writing time. They have figured out what works, and just repeat it. I don't remember ever hearing an author say, "Oh, I just sit where ever I am and sometimes use my laptop, sometimes use the desktop machine, and sometimes write long hand." They all repeat the process. I want to thank Walt for his piece. It offers me some insight (part of the goal of the title of his publication) and perhaps a model to use as I set up a new life. Perhaps writing will become more a part of my life, and Walt's clear and lucid explanation of what works for him, will help me become a better writer. My last day at work was actually at the first meeting of the Bridgeport Alliance for Young Children. It was held at the North Branch of the Library, and since I committed to it, I was there to open up for the caterer, and to do my part of the program. 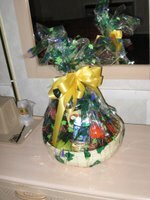 I was worried when I saw that gift basket carried into the building, and my suspicions were confirmed...it was a gift for me! I headed out after the meeting with my packed car and trailer. After a short stop in Norwalk to say a last good-bye, I hit I-95 at about 12:15 pm. I was happy, only 15 minutes behind my self-imposed schedule. Traffic was stop-and-go until Stamford, and then cleared out pretty well for the rest of the day. Because of the trailer, I could not take the Merritt Parkway, and took I-95 into New York, then I-287 (Cross-Westchester) across the Tappan Zee Bridge and on into New Jersey. I got to I-80, and that's what I'll be taking all the way to Chicago! (Go ahead, do a web direction search on a trip from Bridgeport to Eau Claire....of the total trip of about 1,100 miles, there are 727 miles on I-80, and another 239 miles on I-94 [that's tomorrow].) I'll be spending tonight with Nann Blaine Hilyard, Publibber and ALA Exec. Board colleague. Then on to Eau Claire! It is only days to departure for Wisconsin. I go to my office twice more, and then the final day is with a meeting at the North Branch. Thanksgiving was not quite as advertised in the "Farewell Tour." My son's fiancee did not make the trip from Maryland (which simplified the sleeping arrangements), and my brother Thomas did not come down with our mother. On the "plus" side, my brother Paul and his family did bring their dog, Rusty, the thirteen year old Chow mix. He is definitely getting old. He does not run up and down the stairs the way he used to, which was good for our cat who is terrified of him. Contrary to Robert Putnam did bowling NOT alone. On Saturday noon time, we met my sister Sue and her family in Torrington for bonding and bowling. Some folks I know would find it strange to be in a crowd of 15, where you are related to all but three by blood and to those three by marriage, but that is how we bowled. My mother presided, and the siblings were Paul, Sue, and me. (In birth order that is #5, #4, and #1). Sue and I each have three children (who were all there), and Paul has two. Our spouses were the ones in the crowd who were related "only" by marriage. In typing this, it occurs to me that we were the first three to get married, also. I was first, Sue was second, and Paul was third. Hmmmm. It was a nice holiday, and I am packing and finishing the house projects like a mad-man. Right now I am waiting to go to church before changing into work clothes and tackling the last of the wiring in the attic (for the new outlets) and then the sanding of the wall patches followed by priming to prep for painting. I'll do a little work at the office, too, just to finish up packing there. U-Haul should call tomorrow to tell me where to pick up the 5-foot by 8-foot trailer which is what I'll be packing on Tuesday for the Wednesday departure. Wish me luck! You do things in life because you think it is the right thing to do, and sometimes do not understand the importance or impact of what you do. Sometimes you find out, and that is a "pay day" for your volunteer service. Yesterday was such a day for me. I received a wonderful card from one of the scouts I have worked closely with over the years. Here is what he wrote inside the card. Ever since I first joined Troop 68, you have been there. You've been there to teach and guide the troop. Your knowledge and wisdom have been an inspiration for all of us. I will always remember how you helped my patrol fix the mess we were calling beef stew on our first trip to Webb Mountain. Our trip up to Maine was a great adventure that I will never forget. You were a major part of my turning from a troublesome boy into a leadership capable young man. Your leaving the troop is one of the hardest thing to ever happen to it. Although nobody will ever fill your shoes, maybe one of these days we will find someone with the spirit to try. I am sorry I wasn't able to come down to your surprise party last week. You might be glad to know that all your grammar and personal management lessons haven't gone to waste. They have given me a leg up in my business classes. Hopefully I'll see you again real soon. While I think that there others who will step up and do the jobs I have done in the troop....I appreciate incredibly the sentiment. When I read this note (on a very nice card, I got a tingle through my body, and a tear in my heart. While I was trying to do something good, much of what I did was because I was having fun. Well, first it was the FBI, now it is the local law enforcement officials. Back in July of 2005, I was just back from ALA in Chicago. First day back (a Friday) and a got a call from one of my staff that the FBI were in the building. I dashed to the front desk, no FBI. I then headed upstairs to the Information Services Department, where the department head met me and introduced the two agents. They were not here over a USA PATRIOT Act claim or terrorism, it was a simple criminal case. They could have not been nicer, and provided all the paperwork I needed to help them. Well, about a moth ago I heard from a Fairfield (next town over) police officer. 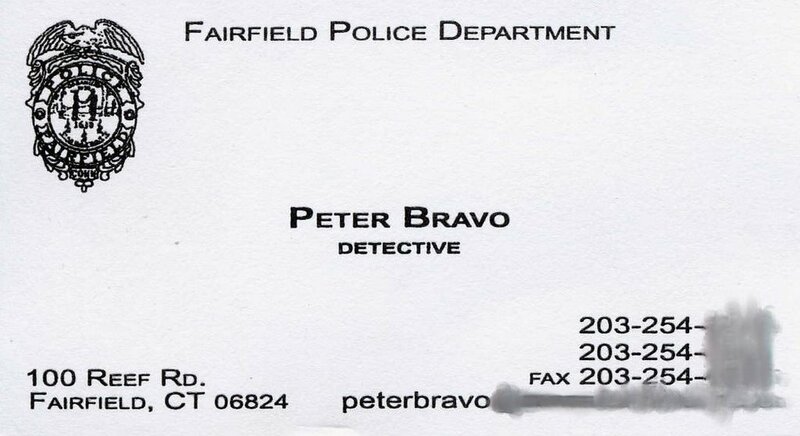 He has a great name for a Detective: Peter Bravo. Lest you think I am making this up, look at his card. I blurred the email and phone numbers to protect him slightly. He was working on tracking down someone involved in credit card fraud who had used library computers to perpetrate the fraud. Again, he had his paperwork in order. (My Board President, an attorney, and another board member, a judge, checked it over.) We happily complied with the request. Just a little more excitement in an otherwise dull [NOT!] week! Another blast of posts. Why? Well last week I went to Eau Claire to find a place to live (Flickr photos to follow some day soon). As a result I had some airplane/airport travel time and was able to type up some pending posts. I've cleaned up my electronic notes, and now most of my print "save for blogging" items. As one of today's three posts notes, the days are getting short. With the Thanksgiving holiday in the middle, I have only eight more work days before departure. Meanwhile at home, live proceeds on a faster pace. While in Eau Claire, I ordered a new boiler. The plumber will come tomorrow to check for what parts he needs, and then will install it on Saturday. We've finished stripping and painting all the doors, and now the trim in the master bed room. I just need to pull some electrical wiring. Then it's time for scraping the ceiling and patching the walls before the final paint. Hope to get all but the scraping and painting done before I leave. If I am lucky, we might get the ceiling done. If I get the wall patching done, I can leave the wall painting to Jill and Brian. We'll see. Stay tuned here and for Flickr photos. I probably blew right past Steven Cohen’s blog post on encouraging librarians to avoid teaching Google search strategies. But I did pick it up in his wonderfully titled column in the September/October issue of Public Libraries. [link?? ]Steven writes the “Internet Spotlight” column, and has two and a half pages on the topic (p. 28-30). Maybe I am just an old fuddy-duddy. I certainly learned Boolean searching very early in my career. I remember sessions with staff from Dialog, and from the New York Times product. In those days connection speeds were so slow, and the price for connecting was so high that we scripted our searches in advance. It was great practice to think out what exactly you were looking for. I remember the shelves of thesauri at Tucson, Bridgeport, and Wilton. We invested in the thesaurus if we used the database frequently so that we could produce great results. With the “one box” search solution, I often find myself constrained. This is most often true when looking for a known item. That one simple little box doesn’t offer options. Even the file searching options which are part of Windows are often frustrating when looking for a document produced on a certain date (or set of dates) and in a known format, and with some known key words. I don’t know about your files, but at the moment I have 25,145 files in 1,461 folders occupying 32.0 gigabytes of storage space. Steven also talks about stemming/truncating. Since I try to be consistent in my naming practices, being able to stem is really important, and not allowed in many of the simple “box search windows.” Go read both items. These days, I’m thinking I should have made up a t-shirt like those for band tours. It would be called the Michael Golrick Farewell Tour. Life has been hectic, and I finally caught up on my electronic clippings for blogging (from September! ), and now am working on my paper files. The fattest is the one for the New England Library Association (NELA). This year’s conference was held in Burlington VT (about 5 hours drive almost due north from Bridgeport). Because of family commitments, I arrived just in time for the banquet at which Lucy Gangone received the Emerson Greenaway award. Lucy is a former NELA President, has worked in a number of libraries in New England including Worcester Public Library and Hartford Public Library. She was the brains and energy behind NELA’s leadership development program, NELLS. She moved to Florida earlier this year, and I am sure will soon be a leader there. There are photos from the event, and others have appeared in places like ConnText. I’ve known Maureen for many years, having first run into her when she was at Yale. I worked with her most closely during ALA’s second Core Values Task Force. (That is worth several posts, some day!) Maureen was the facilitator for NELA’s successful NELLS leadership event. She started by reminding us that leadership does not happin in 90 minutes or even a week. It is developed over time and needs the full commitment of individuals. Among other points she noted how many administrators use “evidence based management” in dealing with problems and complaints. She cited as an example dealing with complaints about “noisy teenagers.” How many complaints do we get compared to the number of people using the library? Does it really constitute a problem? One of her handouts was a great “Six Leadership Styles at a Glance” which we reviewed after rating our own leadership skills. I found it fascinating having used a similar instrument as part of the screening which the City of Eau Claire did for the candidates for Library Director. One great quote: “It is hard to speak truth to power.” Maureen noted that millenials are seeking more feedback than many of us are used to giving. We need to set some new ground rules. She also noted that there are regional culture differences. (This is something I will need to pay more attention to!) Also, there is regional cultural bias in management theories which tend to reflect the cultures of the coasts, and not the middle or southern parts of the country, Effective leadership is about building a relationship with followers. One of my new personal goals is centered around this: seeking to understand and be understood. I did snag the handout for Maureen’s later presentation which I did not attend, called Nurturing Leadership within Your Own Library.Based on the handout, it was much more concretely focused on how to do this in your library. Bottom line recommendation – if you ever get a chance to hear Maureen present on leadership (or anything else, for that matter) GO! It will be well worth your time. Emily Alling & Maura Deedy – Social Software: What you need to know These two recent library school graduates was focused on academic library uses of various social software opportunites. They showed several of them including discussion of myspace, Facebook, Flickr, and others. They noted that reference staff at some academic institutions have used these effectively to encourage students to call on library staff for help. In a way, it is finding students where they are and engaging them. They had some very interesting practical tips. ALA President Leslie Burger presided over an ALA Forum. Most of the Chapter Councilors were present along with a number of other ALA junkies. We talked about a number of issues. Leslie was most gracious in giving me some of the credit for working on the ALA Council Photo Gallery [link]. She also credited my friends (and back row colleagues from ALA Council last year) Rochelle [link] and Jessamyn [link]. Staff continue to tweak how it operates, and so far about 120 Council members are pictured. One of the key tidbits I picked up was the spread of economic impact studies. I know that Florida [link] and South Carolina [link] have done surveys showing that the return on investment (ROI) of spending public tax dollars on public library services ranges from 4 to 12. Leslie noted that Pennsylvania is about to release a study which shows the value between five and six. She also noted that the New Jersey State Library has a calculator [link] vor valuing a library. There was a great panel presentation on NELLS. One participant and one mentor from each of the two sessions talked about the incredible value of the experience. Having done the program twice, NELA has now committed to a schedule with will have NELLS alternate with Counterparts. Staff and member leaders have found it too difficult to organize both events in the same year, so henceforth, they will alternate. Gregor Trinkhaus-Randall – Prepared or Not, Here I Come: Disasters Waiting to Happen Gregor works for the Massachusetts Board of Library Commissioners and did a first rate workshop on disaster preparedness. I picked up a second set of the extensive handouts so that I can share them with both my current (Bridgeport) and future (Eau Claire) libraries. Great content! Museum Reception (ECHO Center) There are many pictures of this event on my Flickr account. As I was waiting in the hotel lobby for the shuttle bus, who should I run into but, Jessamyn West! We sat together and even found Lichen and her mom (who is also a librarian). It was a nice opportunity to see a very nice museum which seemed to be aimed at young people, but also explained the geology and ecology of the area. Nancy Davis – Leading for Libraries and Leadership Does there seem to be a theme in my program choices? Perhaps. Some of the choices were affected by the knowledge that any of the place-specific programs would have less applicability in my immediate future. Nancy gave credit to Maureen for what Maureen had covered. Nancy also had a leadership skills assessment. Part of her message is to remember that we will use different styles in different situations. A really good leader will be aware of this and will change style based on the specific situation and needs of the individuals involved. This was a great follow-up to Maureen’s program. Jessamyn West – Web 2.0, Library 2.0, Librarian 2.0 I won’t say too much about the content here, since Jessamyn has it up on the web. This is the first time I have seen Jessamyn formally present. I have known her for a couple of years, and really like her on a personal level, and respect her knowledge and ability to communicate it on the web. In this presentation, I could see why she is rightfully beloved by the librarians and members of the public she serves in Vermont. She struck exactly the right tone of not condescending, but without making assumptions about the level of technical knowledge of her audience. And she did it with a wonderful light touch and sense of humor. I’ll even go this far: It was great! Closing Lunch The closing luncheon speaker was Jack Canfield the creator of the Chicken Soup for… series. He is now a motivational speaker, and after he talked about how the series was started, he talked about his newest book, You’ve GOT to Read This Book. I had almost escaped the conference without buying a book, but the pitch he gave was just too good. The book has stories from notable people about books that changed their lives. So I bought one for me (and have only dipped into it a very little), and one for a friend who is going through a rough patch. I hope it is a help and inspiration. Exhibits I did wander through the exhibits, not so much to plan on buying anything, but more as part of the Michael Golrick Farewell Tour. I talked with a lot of vendor representatives with whom I have dealt over the years,Some I will see again at national conferences, but others I may not (unless/until I return to the region). It was a bittersweet part of the conference. Whew what a day. Leaving a place is hard work, little did I know! Last night was the regularly scheduled meeting for the Pomperaug District Committee (Boy Scouts). But because the City Council meeting ran so late the night before (I got home at 10:30 pm), I had not completed my homework. It had been a busy day, and I toyed with the idea of going swimming, but it was not to be! I got home just after 5 pm, to meet a plumber for an estimate on a new boiler installation. We talked, and after today's call, we have a deal. Then I went to finish stripping the trim in the closet in the master bedroom. For some reason it took longer than I expected. It was about 7:15 when I finished, and I needed to change clothes and eat. For some reason, Jill was particularly anxious about my being late, but I did not notice. I changed clothes, and ate. I almost went swimming instead of the meeting. It wasn't a roast, but a celebration. Mike Abrahamson did a wonderful slide show with many photos I had never seen. [I've been promised a copy ... DVD since it is a couple thousand photos over the past dozen years.] The Scouts from Troop 68 gave me a framed neckerchief which they all signed, and the adult gift was a James E. West Fellowship. The latter means that $1,000 has been given to the endowment of the Council in my name. Cool. Needless to say, there were speeches, and little gifts. I was kind of embarrassed! I was impressed that they had kept it a secret...and my wife and son were both in on it and managed to keep their mouths shut! Anyway, that meant that when I got home, I still had all that work to do. I fell almost caught up with that having stayed up until almost 1 am to get everything done. Today, was up for swimming, more painting, and then off to work. There was a meeting of the informal steering committee for the Bridgeport Alliance for Young Children, whose first big meeting on November 29, will be my last act. I left that early to go to the Fairfield Library Administrator's Group which is the local group of public library directors. I value that interaction incredibly. That involved lunch. (Yes, a liquid lunch). Now, I've finished my last City Librarian's Report for the Board, and the agenda. Since tomorrow at a really early hour I head to Hartford to fly to Minnesota and Eau Claire. Time to find a place to live! My last catch up post is from Ellyssa and TechEssence.Info. She wrote 5 Reasons NOT to Choose a Technology Solution. It is a long and thoughtful (and humor-filled) post and let me simply cite the highlights. The IT department has worked with COBOL in the past and would LOVE to use it again. They sure do have snazzy marketing! Your boss heard about it at a conference. Your friend told you it was 'da bomb! It’s expensive, it’s cheap, it’s free. I have to admit that I am guilty of advocating #3, and if it is free, I will often take a risk. Go read the full post. This is a critical and important distinction, not just for the issues of customer service (Library 2.0), but also for general library management. She has a great bulleted list talking about some of the questions she (and many of us) wrestles with. That list is: Are our services designed control? Or to empower the user with options? How to talk to your boss. How to survive a meeting that’s poorly run. How to run a meeting. How to explain something in thirty seconds. How to write a one-page report. How to write a five-sentence email. How to get along with co-workers. How to leave a voicemail. I am glad that several of these are skills I already have, and am working on the rest. (#7 is particularly hard for me!) Read the whole detailed post here. I have been hanging on to these items from my blog reader to post about. So since I have a little time to type while at a City Council meeting, I thought I would catch up. The first is from Stephen Abram. He started by giving credit to Steven Cohen for locating Suggestica. While I don’t buy a lot of books, after all, I work in a building with over half a million books. But the categorization is important for library services, because while this is about book buyers, there is much similarity with library users. They broke users into four categories: Browsers, Trackers, Analyzers, and Seekers. Take a look, it will inform our design of new libraries. Leaving somewhere is bittersweet. I've started packing at both home and work. Folks at work are beginning to realize that it is real. After today, I have only 13 more work days. I'm going to Eau Claire to find a place to live and taking 2 days off for that (plus the Veteran's Day Holiday) plus have 2 days for the Thanksgiving Holiday. It is coming soon. A recent email to "all staff" asked: If you get a scrape, a cut, a boo boo, or whatever you would call it....which is your preference to use? Rubbing alcohol or hydrogen peroxide? Well the hydrogen peroxide does that great foaming thing....that is a wonderful effect, but for patient reaction, alcohol is better. So, it depends is the cut on me, on someone I like, or someone I don't like? I'm going to miss this staff and their humor. I'm sure that the folks in Eau Claire will be loads of fun. One of the things I am doing on my visit is joining their Reference Department's "annual game night." It sounds like fun, and I'll have a chance to get to know some of the staff. It turns out that it was a year ago that I added a counter to the web site for this blog. Just by chance I looked at the stats today. In a year, I have had just over 10,000 visits. Is that good or bad? I don't know. I suspect that after the first visit, some folks add the web address to their aggregator for regular reading. That is what I do for most blogs. The only ones I actually visit any more are ones whose entries show up truncated in Bloglines. There was a pie chart, but at the moment that is too much like work to add.